News » Divers » A 100% Galapiat Cirque event in the inner suburbs of Paris! Homepage > News > Divers > A 100% Galapiat Cirque event in the inner suburbs of Paris! 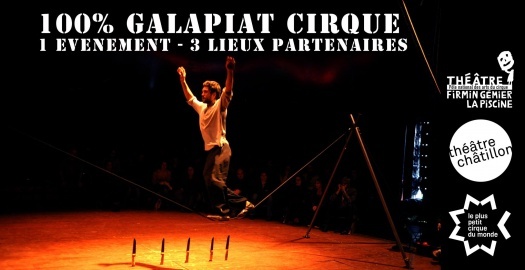 A 100% Galapiat Cirque event in the inner suburbs of Paris! 4 days, 4 shows and 1 unique concert! At the invitation of Théâtre Firmin Gémier / La Piscine, Plus Petit Cirque du Monde and Théâtre de Châtillon, we will perform Boi and Capilotractées on 9th and 11th November, Marathon on 10th and 12th November, and Parasites on 11th and 12th November. On 10th November will be held a unique circus-concert with Impérial Orphéon!